The Cunninghame (or Cunningham) Combination was formed in around 1856 and initially comprised the parishes of Ardrossan, Beith, Dalry, Dreghorn, Irvine, Kilbirnie, West Kilbride, Kilwinning, Stevenston and Stewarton. Later members were Dundonald, Dunlop, Galston, Kilmarnock, Kilmaurs, Loudoun and Symington. Fenwick joined in 1895 and Largs in 1906. Other parishes, such as Kilbride and Kilmory from Arran and Old Kilpatrick in Dunbartonshire, paid to send paupers to the poorhouse. 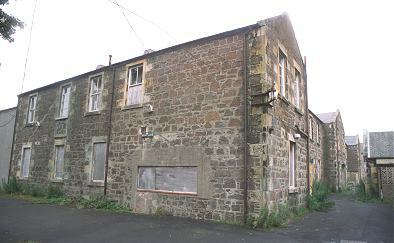 In about 1889, Kilmaurs established its own local poorhouse or almshouse in a rented property which the parish subsequently purchased around 1900. In 1904, the building was reckoned to be able to accommodate up to 6 men, 2 women, and 2 children. The Cunninghame Combination poorhouse was erected in 1857-8 at the north-west of Irvine on what is now Sandy Lane. The Governor, David Hunter,and his staff of three admitteed the first four inmates on the 20th September 1858. The establishment was officially opened two days later. The Governor in 1873 was Hugh Lockhart who was still there in 1897 at a salary of £75 per annum. An entrance lodge stood at the south-east of the site. 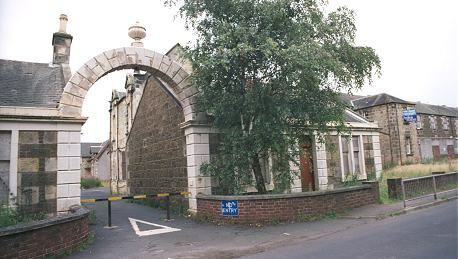 Cunninghame entrance from the east, 2001. The main block faced south and contained the Governor's quarters at its centre. 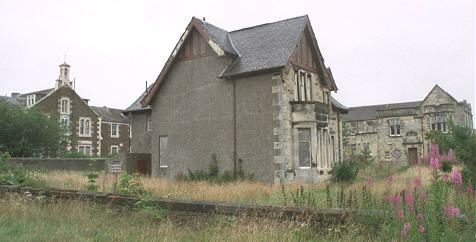 Cunninghame main building from the south-east, 2001. The rear parts of the main building included kitchens, chapel, bakehouse, bathhouse and cobbler's workshop. The areas between the buildings formed exercise yards for the inmates. Cunninghame rear of main building from the west, 2001. In 1858, separate accommodation was provided for 10 male and 10 female "pauper imbeciles and idiots". 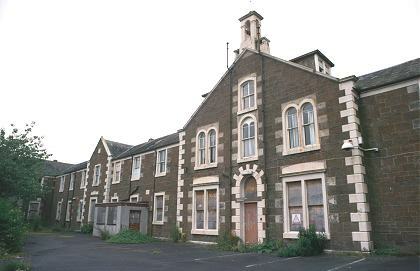 A separate asylum building was later erected at the rear workhouse building. Cunninghame asylum(?) block from the south-west, 2001. Many additions were made to the buildings in the late 1800s and early 1900s, including a new west wing, and a further wing at the south-west containing a new board room and offices. A separate house at the south of the main building may have become the Governor's quarters. Cunninghame from the south-west, 2001. Considerable expansion also took place at the north, with additional infirmary accommodation, and a large group of single-storey buildings which may have been further workshops. Cunninghame from the north, 2001. An inspection by the Scottish Board of Supervision in 1880 found that "the House continues clean and orderly but I observed with surprise that the Committee still maintain the custom of providing but one sheet for each bed." It also noted that "for the safety of officials, it is important that some formal record should be preserved for the punishments inflicted in School" and that "entertainments given to the inmates should be limited to those of good character and to the children". Another report by the General Superintendent of Poorhouses in 1892 alleged that "paupers dying in this House, whose bodies are not claimed by friends, are buried in an enclosed part of the garden. I am surprised that no complaint has arisen with regard to this practice and I am afraid that a great scandal may at any time arise. Protestants and Roman Catholics are buried indiscriminately. The ground has been twice gone over during the present Governor's term of office. If any descendant of a deceased pauper, who may have prospered in the world, desires to erect a headstone to his parents' memory it will probably be impossible to indicate the place of sepulture." Cunninghame responded that there had never been any complaints about this long-standing practice and that the ground in question, some 508 square yards in extents, was walled off from the poorhouse garden. Some action was clearly taken however, as the 1911 Ordnance Survey map shows an area at the north of the site now formally designated as a graveyard. During the First World War, when the Renfrewshire Combination poorhouse at Crookston was taken over by the military muthorities, over a hundred of its inmates were transferred to Cunninghame. In 1930, control of the poorhouse site passed to the local authority and the establishment became the Cunninghame Home and Hospital, providing a 106-bed hospital, wards for the elderly, a mentally defective unit, and an asylum block. It became part of the new National Health Service in 1948 and in 1958 was renamed Ravenspark. It continued to provide psychiatric and geriatric care up until its closure in around 1996. The site was finally sold for redevelopment in July 2011, with the purchasers, Dundas Estates, agreeing to "protect and respect the graveyard". Over the following six months all the old poorhouse buildings were demolished. In December 2012, despite the company claiming to have spent a considerable amount of time investigating the history of the site, police were called in after alarmed construction workers unearthed a "mass grave" of human skulls and bones. Ayrshire Archives, Watson Peat Building, SAC Auchincruive, Ayr KA6 5HW. Holdings includ: Minutes of Poorhouse Committee (1896-1930); Registers of admissions and discharges (1874-1915); Registers of lunatics and psychogeriatric patients (1859-1967); Register of mentally deficient patients (1937-68); Register of offences and punishments for the poorhouse (1858-1907); Register of restraint and seclusion for the asylum (1859-66); Various egisters of deaths, visitors, etc. (1858-1971). BBC News report on discovery of "mass grave" at site.